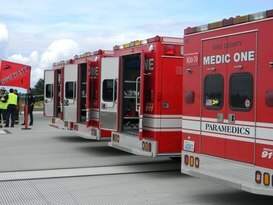 PSERN will help first responders like Medic One better communicate with dispatch and each other throughout King County. On Monday, March 2 the Metropolitan King County Council approved sending the Puget Sound Emergency Radio Network (PSERN)project levy to the voters next month. The levy is a nine-year property tax levy lid lift proposal to raise revenue needed to replace the County’s aging emergency radio system. The emergency radio system is used to dispatch first responders (Police, Fire, EMS) to incidents and allow responders to communicate with each other at those incidents. The system has four owners-King County, the City of Seattle, Valley Communications Center (ValleyCom), and the Eastside Public Safety Communications Agency (ESPCA). The proceeds of the levy would go toward the capital, financing, and other costs associated with the replacement project. PSERN would replace aging components and provide new technology to support emergency dispatch and incident scene communications. If approved by voters, the levy lid lift would be levied at a rate of not more than $0.07 per $1,000 of assessed value. The levy is projected to generate $273 million in revenues. Based on the 2015 median home value in King County, the cost to the median homeowner would be $26.46 per year. Members from the first responder community gather to learn about the PSERN project. 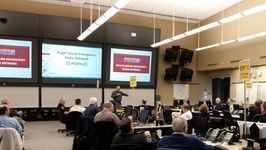 Last Month, the PSERN team held two open houses at the King County Regional Communication and Emergency Coordination Center (RCECC) in Renton. "This is a great opportunity to talk with first responders and hear their questions about the project," said Project Director David Mendel. The 3-hour session featured refreshments, networking segment, presentation, Q&A period and one on one's with project subject matter experts. "These events are a way for us to learn what is important to those using the network," continued Mendel. Topics ranged from project details such as site acquisition and development to end user radios, migration and training. The next open house will be held this Thursday, March 12, 9am-noon at the Redmond Police Department. 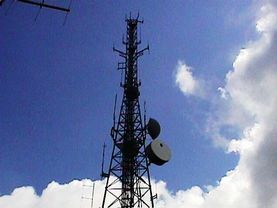 One of the exisiting radio towers. Site visits have begun! PSERN staff along with the project's A&E consultant, Odelia Pacific Corporation (OPC) have been on the road doing assessments of designated sites. These visits are important to ensure each site is viable for building. A total of 27 out of the 46 sites have been assessed so far. 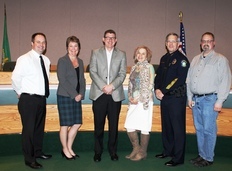 Pictured left to right: Kurt Triplett, Kirkland City Manager; Lora Ueland, Executive Director, Valley Communications; Bill Kehoe, Chief Information Officer, King County Department of Information Technology; Patti DeFazio, Director of Financing & Contracting Services, City of Seattle Department of Information Technology; Ron Gibson, Redmond Police Chief and Chris Elwell, Fire Commissioner Region 6. Not Pictured: Fred Jarrett, Deputy Executive, King County. The PSERN Steering Committee is comprised of members from each of the four owners-Valley Communications (ValleyComm), Eastside Public Safety Communications Agency (EPSCA), City of Seattle and King County. This committee meets once a month to discuss various aspects of the project. They also provide input and recommendations on major project decisions including scope, schedule, budget, design and various other strategies. 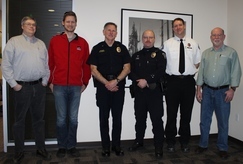 Ned Wooster, Seattle Public Utiliites, Andrew Johnson, Norcom, Lieutenant Doug Shepard, Redmond Police Department, Officer Brad Estill, Bellevue Police Department, Captain Chris Lombard, Seattle Fire Department, Allen Alston, King County DNRP Safety. Additional members not pictured. Representatives from various user groups in King County make up the PSERN Task Force. Members on the team are actual users of the radio system. They will lend their expertise on important issues such user training materials, coverage drive test participants, selecting baseline accessories and user training material development. PSERN project Technical Lead Sean Douglas says the Task Force members selected play a vital role, "This team is an integral part of the project. They will assist on key decisions we make to ensure we meet the needs of our users." Coming to a Neighborhood Near You! If you would like us to attend one of your meetings drop us an email! The Puget Sound Emergency Radio Network (PSERN) is a proposed construction project that will replace the aging emergency radio system with a new network. For more information, visit www.psern.org. For current subscribers, update your preferences or unsubscribe. If you have questions about this service, see FAQs here.